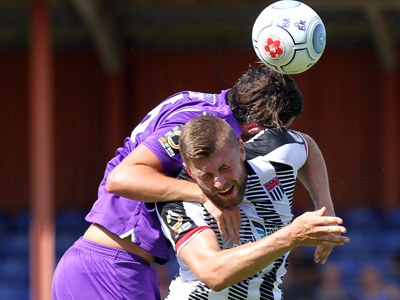 City suffered a disappointing opening to their 2018-19 Vanarama National League South season as a late penalty condemned them to a 2-1 defeat against Dartford at Twerton Park this afternoon. It had all looked so different when they started lively and deservedly went in front after just nine minutes, Adam Mann firing home from 20-yards. This was as good as it got for City though as they faded after this bright start allowing the visitors back into the game. And right on half-time they levelled when Bradbrook rose highest to head a corner toward goal and despite Joe Raynes clearing it from under the bar the linesman flagged that the ball had crossed the line. Neither side could take control of the game after the break but with six minutes to go the Darts were awarded a penalty. The referee had frustrated City for much of the game, awarding numerous free-kicks as the Kent side looked to go to ground as often as possible, so it was no real surprise when he pointed to the spot after Robbie Cundy had tangled with an opponent near the touchline. However, Bradbrook blazed the penalty over the bar. Two minutes later though the referee was centre-stage again when Ross Stearn’s mis-placed pass sent Sam-Yorke clear on goal only for Ryan Clarke to trip the substitute just inside the area. This decision was more clear-cut and Sam-Yorke showed Bradbrook how to do it, cooly placing the ball down the middle of the goal.